More than half the receipts from Christie’s inaugural Exceptional sale in New York came from a single lot. And it was one with quite a history. The bronze bacchic figure by Adriaen de Vries – $24.75m (£16.6m) at Christie’s New York. 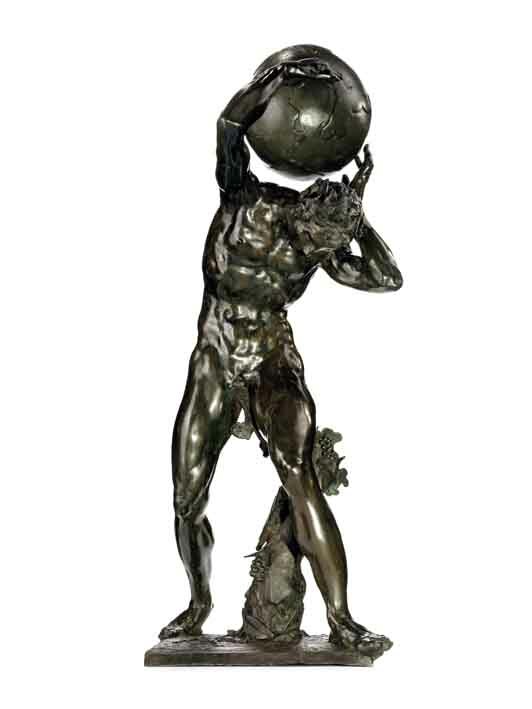 The 3ft 7in (1.1m) high bronze bacchic figure supporting a globe on his shoulders by the late 16th/early 17th century Dutch Mannerist sculptor Adriaen de Vries (d.1626) took $24.75m (£16.6m). The price sets a new record for de Vries, beating by a huge margin the previous high of £6.8m paid back in 1989 at Sotheby's for the Dancing Faun, now in the Getty Museum. Christie's unrecorded figure, signed Adrianvs Fries 1626, was discovered set in the centre of a pool of water in the courtyard of a castle in Austria belonging to a German noble family. It had been there since at least 1700 when an engraving of the house showed it in situ. It was originally due to be offered in Christie's Exceptional sale in London back in July 2011 but last-minute problems surrounding the original export licence forced an eleventh-hour withdrawal. The problem was resolved and, following a reapplication, the statue appeared for sale in New York. It came with an estimate that, at $15m-25m, was double the conservative £5m-8m ($7.6m-12m) estimate of 2011. While there was bidding from the room up to around $17m, the ultimate battle was down to two phone bidders, with the hammer finally falling to the Rijkmuseum in Amsterdam. After the sale, the museum's director of collections, Taco Dibbits, said of their purchase: "We are thrilled to have acquired this exceptional work of art by the Dutch Michelangelo, Adriaen de Vries. Until today there was no sculpture by him in the Netherlands." The lack of major works by de Vries in the country of his birth is perhaps not so surprising. Although he was born in the Hague c.1555, he spent the whole of his life working away from his country of origin, first in Florence, in Giambologna's studio, then Milan and, most importantly, in Prague at the court of the Holy Roman Emperor Rudolf II. After Rudolf's death in 1612, de Vries worked for various private patrons, including the military commander Albrecht von Wallenstein, for whom he created a series of bronze classical statues for his palace in Prague which were looted by the Swedish army in the 1648 Sack of Prague and are now in Drottningholm Palace. These were de Vries' last major commission and the stylistic similarities to Christie's bacchic figure have prompted one suggestion that it may have been part of this late series, datable to c.1626. But as the figure was not among the looted bronzes it may equally have been for a different patron. As the 1700 engraving shows it in place in the vendors' family home, it may have left Prague early in its life. Another possibility is that it arrived as part of the dowry of Margarethe Leopoldine, Gräfin Colonna von Fels, who married an ancestor of the vendors in 1693. Her great-grandfather, Leonhard Freiherr Colonna von Fels, had participated in the 1618 Defenestration of Prague. The alloy used in the globe which Christie's statue supports differs slightly in composition from the main figure, prompting the suggestion that it is slightly later in date. As the figure itself plainly has bacchic associations, Christie's specialist Donald Johnston suggests that the statue may have changed subject late in the production process with the globe substituted for a barrel or wineskin. The Exceptional format - in a single sale offering a very select, mixed-discipline mix of furniture and works of art - was pioneered by Christie's in their London rooms in 2008, but this was the first in New York. In total 30 of the 47 lots offered on December 11 found buyers to net a hammer total of just under $35.5m (£23.8m). The buyer's premium was 25/20/12%.